In less than 24 hours, Iran and Morocco will face-off in the opening match of the 2018 FIFA World Cup’s Group Bin Saint Petersburg. Both teams are given slim chances of advancing from a tough group, but their ability to surprise the world should not be overlooked. The opponents are daunting to say the least. Both teams will face the 2010 World Cup champions Spain and the current European champion Portugal. Morocco will not be an easy match for Iran either. As one Africa’s top teams, Morocco is packed with talented players who kick for European clubs such as Juventus, Real Madrid, and Ajax. Iran’s team does not seem to be a pushover and should be taken seriously. It is full of talented young players who have gelled well together under the direction of the team’s experienced Portuguese coach, Carlos Queiroz. The ultimate results are hard to predict and anything can happen on the wondrous World Cup stage. So rather than predicting the outcomes, I thought it may be interesting to analyze Iran’s strength, weaknesses, and overall style of play. 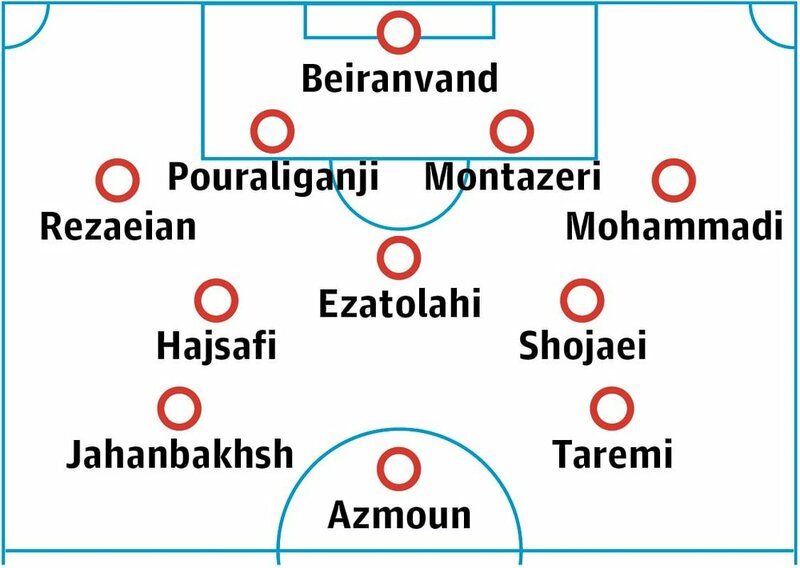 Iran’s Strengths: They have more strikers and attacking mid-fielders than the 2014 World Cup and that could help Queiroz with his tactical plans. It may allow the team to take more calculated attacking options. In addition to Sardar Azmoun who plays for the Russian club Rubin Kazan, Iran has Alireza Jahanbakhsh who became the top scorer in the Dutch league. Karim Ansarifard is the second top scorer in Greece, Kaveh Rezaei was among the top scorers in Belgium and Saman Ghoddos had a great season with his club in Sweden. They play well as a team. They know how to defend as a team and press affectively. They seem very united and no dramas or negative rivalries exist between players. Iran’s Weaknesses: Iran struggles when it comes to its defensive line. Defense at times seems confused and unorganized, especially when the defensive midfielder, Saeed Ezatolahi, is not in the game. Bad news is that he is suspended for the crucial opening match against Morocco. Queiroz’s search for replacements have not provided the perfect match. Another major weakness in defense is the center back. Morteza Pouraliganji and Jalal Hosseini have been reliable center-backs, but after Queiroz decided to leave behind Hosseini, he is forced to deploy another defender alongside Pouraliganji. Cheshmi seems to be the replacement, but that’s not the position he usually plays, so his comfort level seems to be low. The percentage of defensive mistakes go up dramatically when the speed of the game goes up and this gets worse without Ezatolahi. Iran still struggles with positioning and covering gaps that open up between the defensive and midfield lines. The team has also struggled with stamina and physical strength in the past. Game Analysis: Through the friendly matches that lacked the expected quality, Queiroz attempted to build the team’s self-confidence before the World Cup. The team is much younger than four years ago and inexperienced. Lack of experience at times results in messy and slow starts, but they typically find themselves after 15-20 minutes. Iran’s team is not built to come back from behind. If Iran falls behind early on, more than likely it will not be able to recover. According to an analysis by a popular sports program in the country, Iran has been scored on first in 16 games under Quiroz’s tenure. They have lost every single of those games. Thus far, the current team has demonstrated better tactical abilities compared to 2014 and Queiroz has recognized this improvement. As a result, his style is becoming riskier, which he demonstrated in the friendly matches against Tunisia and Algeria. He is trusting the players to begin pressing in the opponent’s half, which has resulted in some great scoring opportunities. This tactic may be utilized against Morocco in particular. More than likely, the tactic adopted against Spain and perhaps even against Portugal will be a deep multi-layered defensive game in Iran’s own half. Iran’s approach would be a less risky game against those two teams where the players are forced to take advantage of potential counterattacks and care less about a possession game. This style of play calls for high levels of coordination and tactical discipline in pressing and requires high levels of physical readiness. It forces a lot of one-on-one battles that need to be fought and won. Iran has made incredible tactical advances in this area, but the old-school style of some of the defensive players had to change for this approach to yield results. Utilizing this approach also requires defenders and wingers who are accurate deep passers in order to set-up the counter attacks in transition. Judged by those indicators, Pejamn Montazeri seems to be the only defender who had a satisfactory performance during Iran’s friendly matches. The rest of the defensive line made a lot of errors, especially when the speed of the game increased. An easy way to threaten Iran is to take advantage of the spaces that open up behind the defensive halfbacks. Something that the Tunisian and Algerian strikers managed to utilize well.